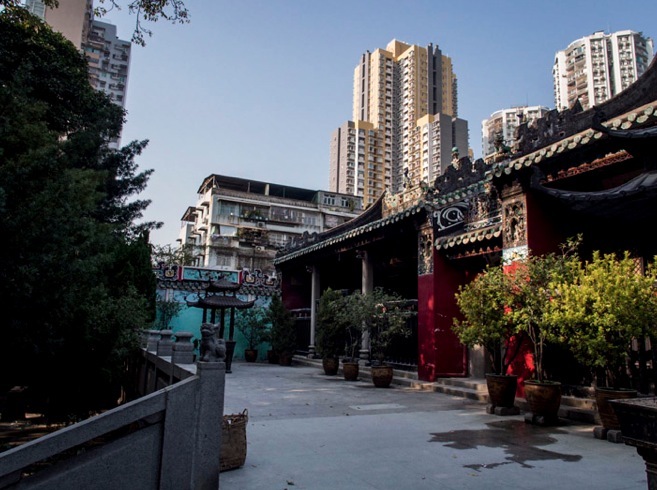 This is one of the three famous temples in Macau and because it is a little further North of the city centre, I’ve never been there. But given that the Sun Yat Sen Memorial house is only a few footsteps away I managed to finally visit this temple too. Kun Iam Temple is one of the oldest temples in Macau, founded in the 13th century to venerate Kun Iam, the Chinese god of mercy. 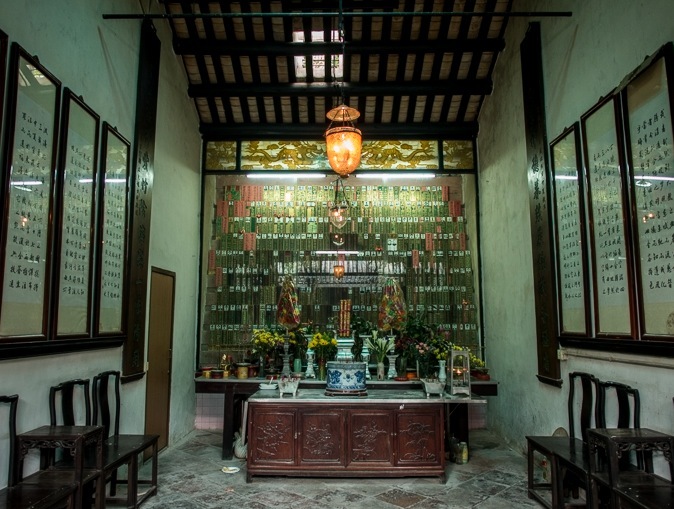 Though the current buildings date to a restoration performed in 1627, the original temple dates back to the 1400s and is one of only two temples in the city to pre-date the arrival of the Portuguese in Macau. The large complex is sealed off through a big wall. We entered through the main gate and made our way into the courtyard. To our left people were burning incense sticks, to our right a monk was hanging out the big curls of incense that people had donated. The courtyard was nicely shaded (even if it was not hot when we visited) and there were lots of trees and shrubs, unbelievable that we were still in the centre of a busy city, with lots of cars and motorbikes on the road. But everything was quiet inside the temple. I read that the first treaty of trade and friendship between the USA and China was signed at round stone table in the temple’s terraced gardens in 1844. The temple houses images of Buddha, representing the past, present, and future, as well as the goddess of mercy (Kun Iam) dressed in the costume of a Chinese bride. 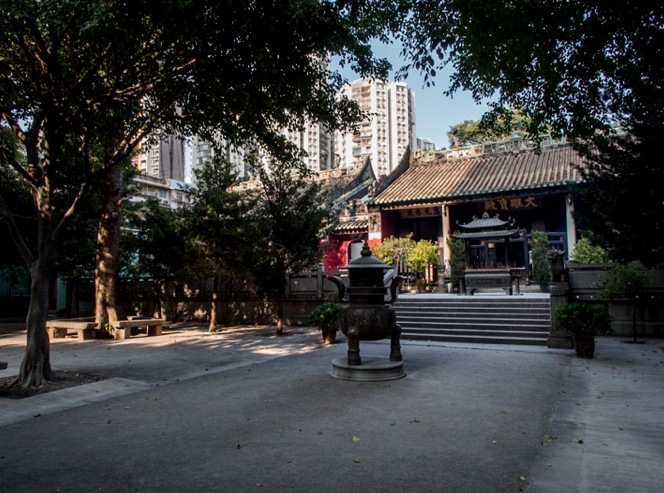 The temple complex is home to three halls: The Hall of Sakyamuni, one Buddha of Longevity Hall and one Kun Iam Hall with several small shrines around these three main halls. I started looking at the one to the right. 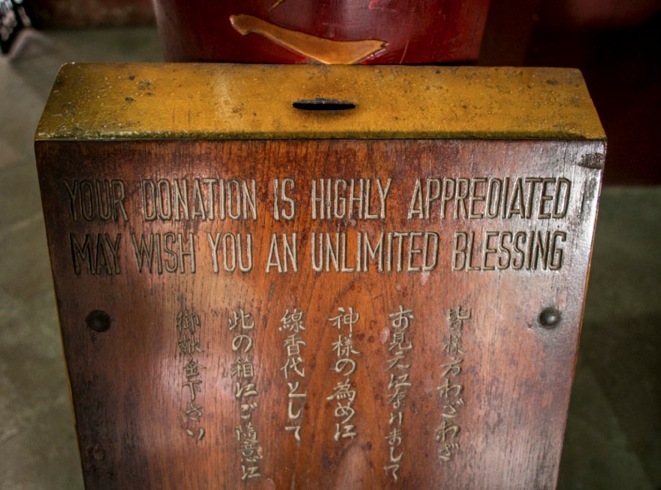 This one was empty of people, but full of statues of gods and donations to them. Candles were burning, incense sticks were smelling and there were some nice flower arrangements. The central hall was much bigger, but also much more busy. Lots of people were visiting the temple and praying. It didn’t feel right to disturb them to take pictures. The hall to the left seemed to be the oldest one – and parts of its entrance area were also used as storage. Again, the hall was quiet and empty. Going through the halls to the back, I discovered the rooms where people remembered their deceased family members and friends. Each room was home to glass vitrines that were filled with name plates. Some also included pictures. A few visitors had left food and drink offerings for the deceased – I’m always touched by this. I saw a few fruits and sweets, but also the meat and rice dish and even a McDonald’s coffee. I always wonder if that means the deceased really loved exactly this coffee or if the visitor only had time to pick one up from McDonald’s? Also some of the name signs were still wrapped in pink paper – they looked like placeholders to me. Does this mean the place has already been purchased and reserved? I also noticed that some couples had already purchased the plate for a couple and added both names and pictures, but one partner was still alive – so the name and picture was just covered with red paper. That’s a scary thought to know that the name and picture has already been added, I’d be more comfortable with just an empty space being reserved, like it’s done in Germany. An empty space on a grave stone or plate indicates that the space is reserved but does not list any names, pictures or details yet. 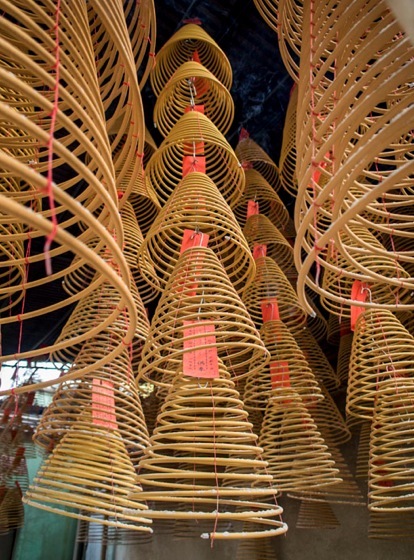 Anyway, this is not peculiar to the Kun Iam Temple in Macau. 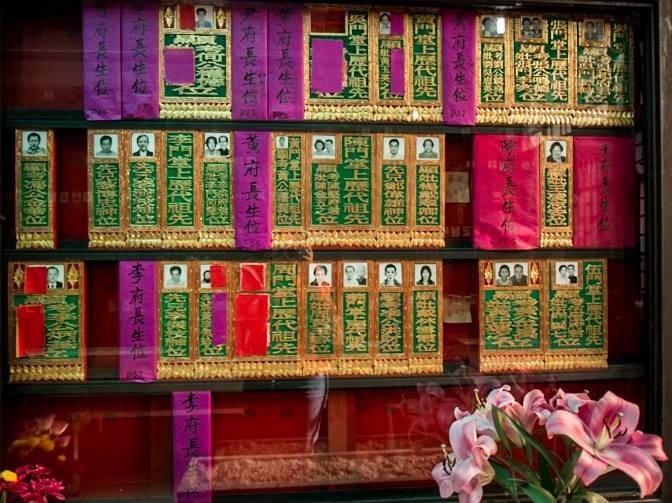 You can see similar name plates and offerings in various temples across Macau and Hong Kong. What I really enjoyed while walking through the Kun Iam Temple is that it is a temple that is still very busy, but does not feel too crowded or loud. It is spacious and you can walk around the halls and the courtyard, enjoying the sights and views. 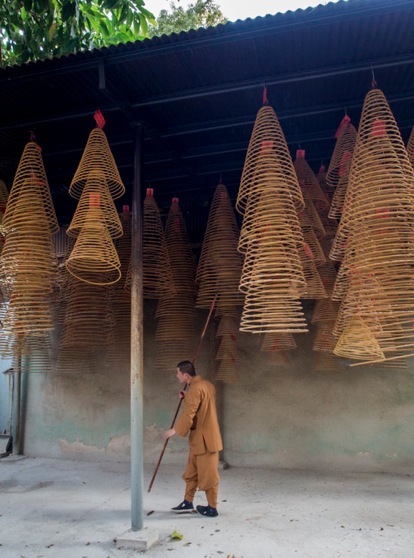 Also the incense smell was not too overpowering! Great post about the mini vegas! I love it!!! I’ve also blogged about my recent Macau trip!